Staphylococcus epidermidis is the leading cause of hospital-acquired infections associated with implanted medical devices. Likewise, Proteus mirabilis is one of the leading causes of nosocomial Urinary Tract Infections (UTIs) and is associated with urinary catheter blockage. Both organisms produce biofilms, which make them less susceptible to antibiotics. Therefore, these infections are often notoriously difficult to treat and in many cases lead to complications. Preventing biofilm formation or killing a pre-existing biofilm would be useful solutions since biofilm formation is a phenomenon commonly observed in these organsims. 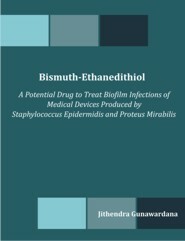 This study investigated the in vitro efficacy of Bismuth-ethanedithiol (BisEDT) against biofilms produced by P. mirabilis and S. epidermidis. Anti-biofilm activity of BisEDT was evaluated in terms of inhibiting/preventing biofilm formation and eradicating/killing pre-formed biofilm produced by single species S. epidermidis and P. mirabilis. Jithendra Gunawardana is a Research Scientist with extensive experience in microbiology, immunology, hematology and molecular biology. He has held active research positions at Boston Medical Center, University of Pennsylvania, and Temple University hospital. He is currently a researcher at the British Columbia Cancer Agency.